Here in Massachusetts, it's finally spring with some consistency. Of course, we still have the occasional "surprise! It's 40 degrees and raining while you have to be outdoors in dressy clothes" day, but for the most part, the sun is shining and birds are chirping. I don't know about you guys, but when the weather gets warmer, our dinners get pretty basic. The grill gets a lot more use and we start having more simple grilled meat and veggie dinners. Things like grilled chicken, however, are not terribly interesting on their own (even when it's made really well). 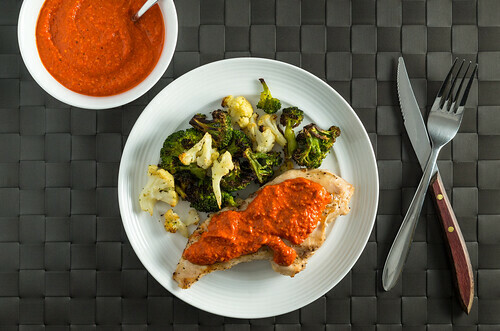 Enter this Romesco sauce. 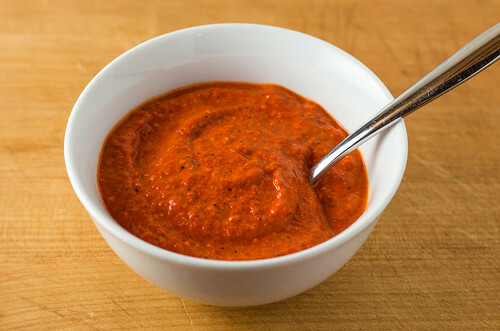 A smoky, garlicky concoction that originated in Spain, Romesco sauce is super easy to make if you have a food processor. My version eliminates the traditional slice of bread as a binder (blah blah gluten-free blah blah) and uses jarred roasted red peppers to cut down on the prep work, because... well, have you read the name of my blog? Roasted garlic is still a key component, and it's not hard to do the traditional way. However, I have a few suggestions to cut down on the work. One - go ahead and use your toaster oven. That way, you don't have to heat your whole kitchen on a hot day just for this. Two - just bundle everything up in a piece of foil and stick it in the oven for minimal cleanup! Three (this is the big one, and Italian grandmothers everywhere are probably cursing my name) - use pre-peeled garlic cloves! Around here, I can think of 3 stores that sell pre-peeled cloves: Trader Joe's, Wegmans (both TJ's and Wegmans come in bags with sealed pouches of 10 or so cloves) and Stop and Shop (they have a jar of peeled cloves in the produce section). If you roast the already-peeled cloves, you get to skip the annoying step of fishing out hot, squishy cloves from a whole roasted head of garlic. Once the garlic is roasted, then everything takes a spin through the food processor, and voila! A big ol' batch of Romesco sauce. 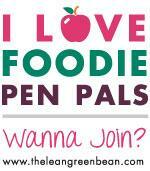 I guarantee you'll be able to carry it through at least 3 different (two-person) meals in one week. How else could you use it? 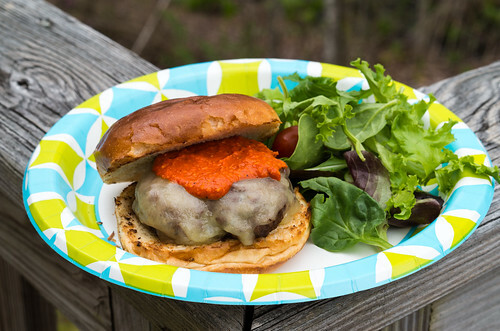 If you have a favorite use for Romesco sauce, let me know in the comments! Hey look, there are some Frozen Roasted Vegetables on the side! Preheat oven or toaster oven to 450°F. Tear out a square of aluminum foil. If roasting a whole head of garlic, slice the top 1/4"-1/2" off with a sharp knife. Drizzle with olive oil and sprinkle with salt. Place in the middle of the foil piece and bundle it up. Put it in the oven and roast for 20-30 minutes, or until the cloves are easily pierced with a fork. Let it cool down, then remove the cloves. If roasting already-peeled cloves of garlic (this is how I roll, because it's much easier), place the cloves in the middle of the foil piece, drizzle with olive oil, and sprinkle with salt. Bundle it all up and shake it up a bit to coat all of the cloves with oil. Roast them in the oven for 20-25 minutes, or until the cloves are soft. Place the garlic, drained roasted peppers, almonds, smoked paprika, and red wine vinegar (or lemon juice) in the bowl of your food processor. Process it for a minute or two, until everything is pureed. You may need to stop the processor and scrape down the sides once. With the processor still running, slowly drizzle in the olive oil. Most (if not all) food processors have a small hole in the feed tube plunger that's meant for this - you can just dump all of the olive oil in there, and let gravity do the work of slowly drizzling it in through the hole. Once all of the oil is incorporated, stop the processor, taste the sauce, and mix in salt to taste (I usually add a couple of pinches).